Všesportovní stadion is a multi-purpose sports venue located in the North-Central city of Hradec Králové. 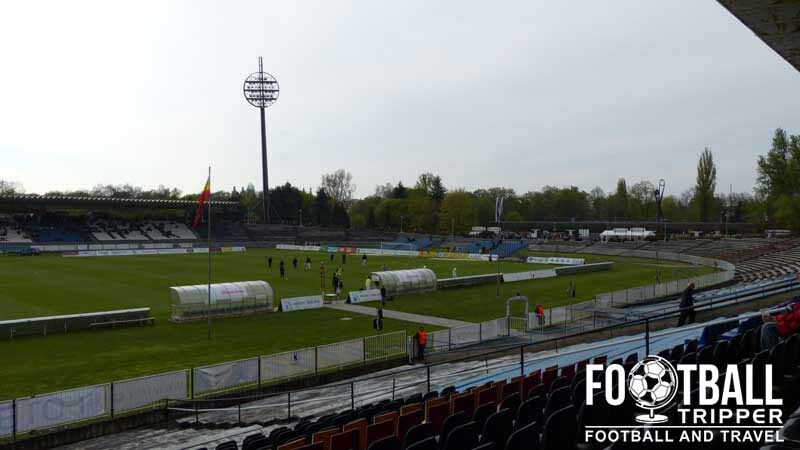 Home to perennial yo-yo club FC Hradec Králové, the ground has a capacity of 7,220 and the funky nickname of Pod Lízátky (under Lollipops), presumably in reference to the strange floodlights. 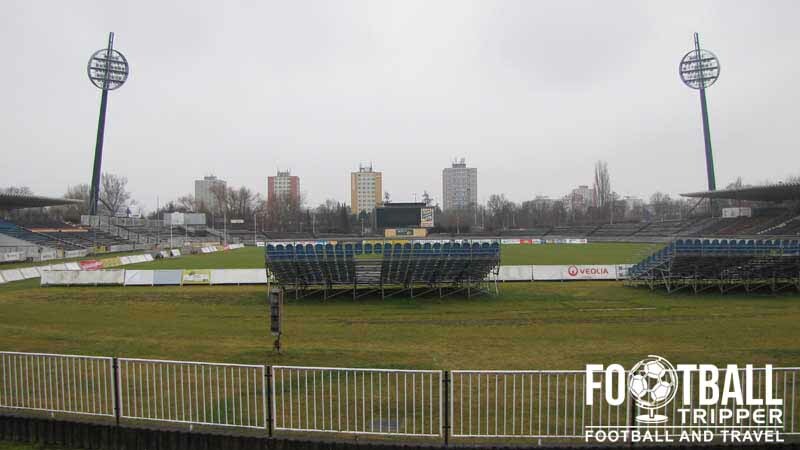 Before moving into Všesportovní stadion located within the area of Malšovice, FC Hradec Kralove had played their home matches on a plot of land next to the city’s hospital since the early 20th century. Whilst popular with supporters, the facilities were very basic and there were concerns regarding the safety of the grandstand which was slowly becoming dilapidated. The changing room facilities were also deemed inadequate much to the displeasure of the players. Working in conjunction with the local council, a plot of land was identified in Malšovice, and construction began on a new set of facilities began in 1959. 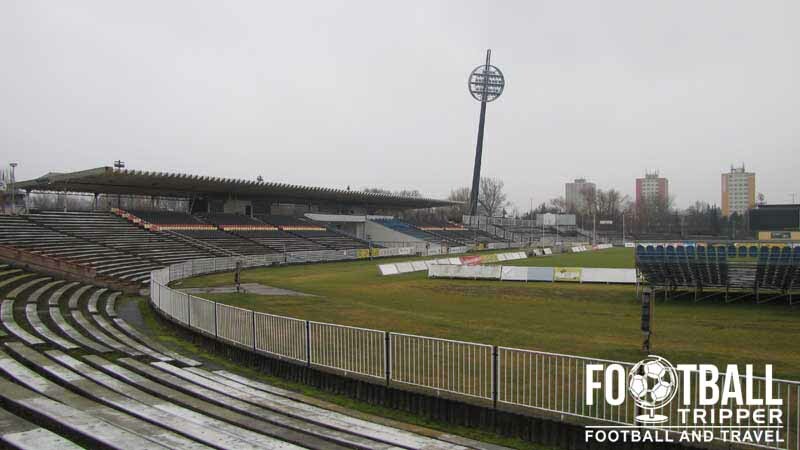 The move to a new stadium coincided with an upturn in Hradec’s fortunes as the club were crowned Champions of the Czechoslavak First League in the 1959/1960 season breaking the monopoly of Prague based teams. The new stadium provisionally opened a year later, however it wouldn’t be until 11th May 1966 that the stadium would be completed as per the original specification. The first match at the Všesportovní stadion was played between FC Hradc Kralove and Bohemanis Praha. Blessed with decent weather, 8,000 supporters travelled to the new ground to see both sides go hell for leather in a narrow 4-3 defeat. 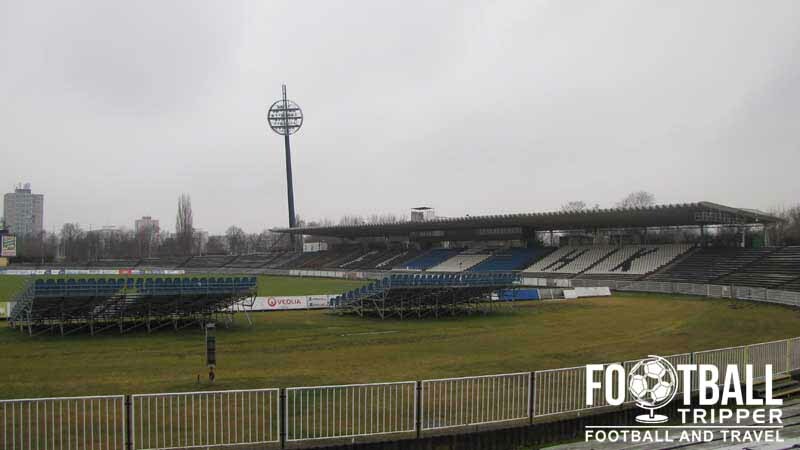 In recent years the stadium’s official capacity has tended to fluctuate as Hradec have flitted between leagues which have different ways of measuring seats. Although large bleachers mean a theoretical capacity of 15,000+, it is now common practice to determine the capacity by number of separate seats. Thus in 2010 the capacity was reduced to 4,000 however it has since climbed up to 7,220. Since opening the highest level of football played at Všesportovní stadion to date undoubtedly came in the 1995/1996 season when Hradec participated in the Cup Winners Cup. Coming off the back of triumphant victory against Viktoria Žižkov on penalties, the club reached the quarter finals after defeating F.C Copenhagen but were unable to progress past Dynamo Moscow. Vsesportovni Stadium is comprised of four stands: North, East, South and West.